The gorgeous bank holiday weekend sunshine may have disappeared here in the UK, and Hurricane Harvey is swamping Texas but I refuse to believe summer is over, especially as there are two more days left to grab the fantastic Members Club Summer Offer. Though I can’t deny it is that point in the school holidays for me where it is time for the dreaded school shoe shopping trip, but this year it proved to be a useful reminder for some great marketing advice, which you can read all about here in ‘Nooooo, you’ve got to sell the idea to them!’. I know I don’t want summer to be over, but I do want you to be planning Christmas! I do like a paradox! Seriously now is the time to be thinking and planning Christmas, you can discover great tips and advice here in this brilliant Christmas planning article. Finishes on 31st August! Sign up for Annual Members Club membership before the end of August 2017 and you will get 12 months members for the price of 10 PLUS full, immediate, lifetime access to my signature marketing course for creative business owners ‘Make Your Way To Success’! Get all the details here. This amazing offer is also available to existing members. Facebook pages who ‘repeatedly share stories marked as false… will no longer be allowed to advertise on Facebook.’ Brilliant news as Facebook move to reduce false news and hoaxes. Source: Facebook. If you see a ‘news’ article, check it’s real before you share. Every little helps! If in doubt, use a fact check website. This last week Facebook has been really glitchy for me, and while I haven’t seen any announcements (Facebook do like to make random changes!) I did spot a big change to my Facebook App last night. You can now explore posts which maybe of interest to you. So pots based on topics and interests rather than because they have been posted or shared by a friend! By clicking the new ‘rocket ship’ icon you can see a brand new news-feed based on topics. 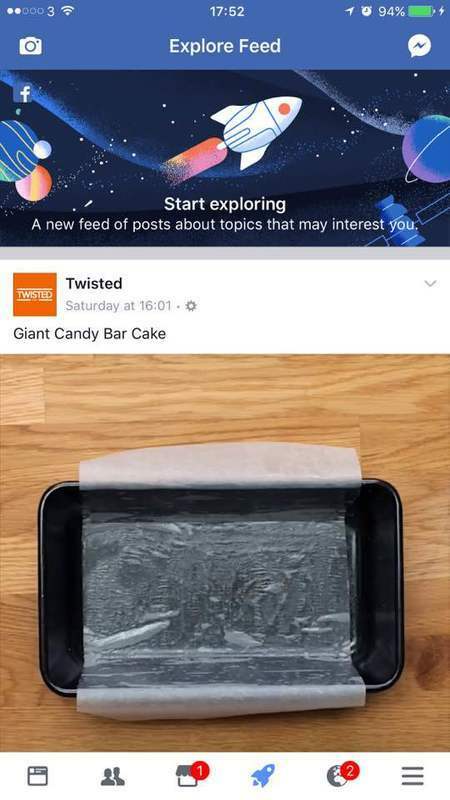 Apparently Facebook things I have shown an interest in cakes! Which I will not be confirming or denying! Have you spotted any other changes recently? If so, do you like them? Let me know!! If you have any questions drop me an email or feel free to stalk me on Social Media. Otherwise, see you next week with more Handcrafted Business news… or is ‘grapevine’ a better name? Remember just two days left to take advantage of the Annual Members Club membership to get 12 months members for the price of 10 PLUS full, immediate, lifetime access to my signature marketing course for creative business owners ‘Make Your Way To Success’! A Handcrafted Business sharing all the advice and information you need to create the handmade business you crave. Your details will never be sold or passed on to anyone. You can unsubscribe anytime you like. *Everything shared is fully researched, happening now and is information which may have an impact on your handmade business.